You are not alone if you have Irritable Bowel Syndrome (IBS). IBS is common. It affects about twice as many women as men (in western culture) and is most often found first diagnosed in people younger than 45 years. No one knows the exact cause of IBS. 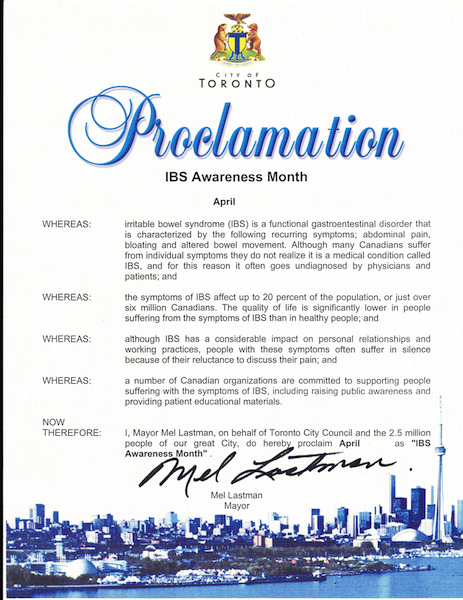 In 1997, the International Foundation for Functional Gastrointestinal Disorders (IFFGD) in the US and in 2003, the founder of IBS Patient and Support Group and others in Canada, designated April as IBS Awareness Month. During this time, It is opportunity for people to participate who are usually quiet about their IBS, to shed some light about what it is like to live with IBS. We encourage you to blog, tweet or post about living with IBS. #LetsTalkIBS begins a new conversation about Irritable Bowel Syndrome. On every April 19th we are asking you to use the hashtag(s) #LetsTalkIBS or #IBSAwarenessDay on all your social platforms. Use it once, use it often. Together we can raise awareness about Irritable Bowel Syndrome on World IBS Day. Read all about IBS here or check out some awareness postings, videos and events below. It’s officially #IBSawarenessmonth and while we have made great strides in finding better ways to diagnose and treat IBS, we are now believing a cure is possible. Let’s start this month on a positive note because #weknowIBS and we will do everything it takes to get there. Raise awareness of IBS by watching and SHARING this video. IBS impacts 40-45 million in the US and 1 billion globally. Chances are you know someone with IBS…maybe that is you, your best friend or your child. Understand the patient experience, lack of research funding and how YOU can personally make a difference.